The device you see above is the devil's spawn. 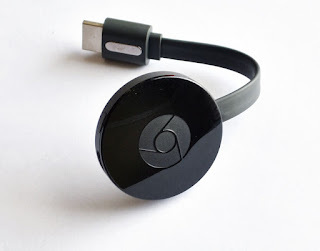 Why, oh, why, oh why did anyone invent Chromecast ? When everyone else is delivering electric cars, Google delivers a mule. Sure it kinda does a job, but it's so crude and pathetic, and encourages laziness beyond belief. In the UK BT, a major telco, controls many of the major sporting rights. They did this to shore up their broadband monopoly. But, unless you subscribe to a cable or satellite service, the only way of getting all the major sporting events onto your big screen is Chromecast (or a cable from your PC). Yes, they have no apps for Roku, LG, Samsung, etc... Nothing that would make life easy for their broadband customers. God forbid. This evening I lost my broadband connectivity (with BT), this obviously stopped the catch up sports I was watching. But also froze my app and my iPhone. I had to reboot thanks to Chromecast being so bloody dumb. So, you pay a couple of billion for sporting rights and can't be bothered to drop another 0.1% of this to make sure people can watch them properly. WTF? Another major UK sports provider, Premier Sports do not offer the ability to pause or scrub a sports programme. And, yes, you guessed, Chromecast is the only way of watching their sports output. Google should be totally ashamed to have launched a piece of technology that makes life so much worse for viewers. Any broadcaster who depends on this rather than building a proper delivery ecosystem is a joke.